Shagun Gupta, renowned for her outstanding gemstone selection and curation unveils mesmerizing vintage jewellery pieces that pays tribute to the queen of gems. 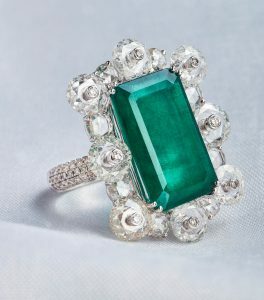 The celebrity gemologist’s penchant for the classic is reflected in the eclectic mix of colors that encompasses pearls, rubies, emeralds, cut and uncut diamonds set in yellow or white gold. 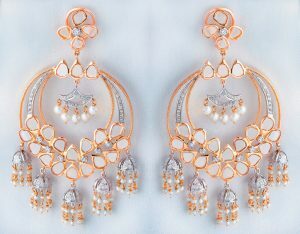 Shagun Gupta’s vintage jewellery collection features custom designed Emerald bracelets, Pearl rings, Tassel Earrings, Roundel Rings, Rose cut bangles, Ruby rings, Doublet Rings, traditional Chand Bali, Jhumkas and diamond studded necklaces. Rich green emeralds make studding style statement and timeless choice for all memorable occasions. The luxuriant Emerald bracelet set in yellow gold combines a stunning array of luminous green emeralds and fiery diamonds tailored to individualistic specifications. This gorgeous armlet invigorates in the rich glow of emeralds sprinkled throughout the spectacular piece with twinkling round diamonds artistically adorning the magnificent swirl. Another beloved classic, the Diamond Bangle is one of the contemporary fashion necessities every woman would love to have in her fancy jewellery box. The bangle crafted in white gold and bejeweled in round cut diamonds is celebrated for its majestic appeal, making it one of the most intrinsic pieces for discerning woman. The Emerald Diamond ring is latest style addition crafted in white gold, centered with large stunning rectangular shaped Emerald stone, surrounded by Rose cut diamonds and paved in distinctive roundel disc diamonds. 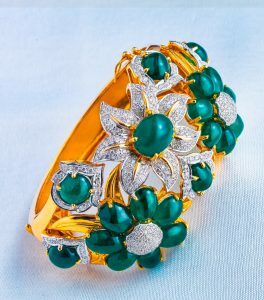 Shagun Gupta’s spectacular creation includes the octagonal shaped Green Doublet ring featuring white gold, beautifully chased in ornate Victorian style, accompanied by Rose cut round diamonds, centered and surrounded by green doublets. 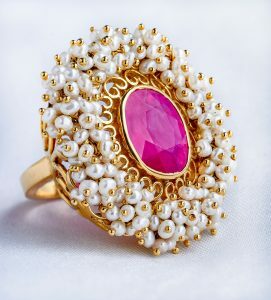 With red being the color of intense emotions, the magnificent Ruby ring embellished in yellow gold and sprinkled in rich glow of pearls makes it one of the rare stands of gems.